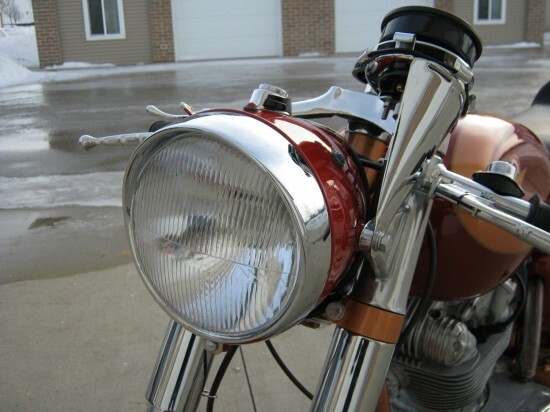 Of of the most interesting things about classic, as opposed to modern sporting motorcycles is the wide selection of configurations and displacements. In this age and in this country, where anything less than a 1000 cc’s is a “learner-bike”, it’s fascinating to see highly developed, very sporting machines with displacements as small as this. Quality engineering and jewel-like construction don’t always go hand-in-hand with more frugal, smaller-engined bikes today, but were common on bantam-weight machines in the 50’s and 60’s. 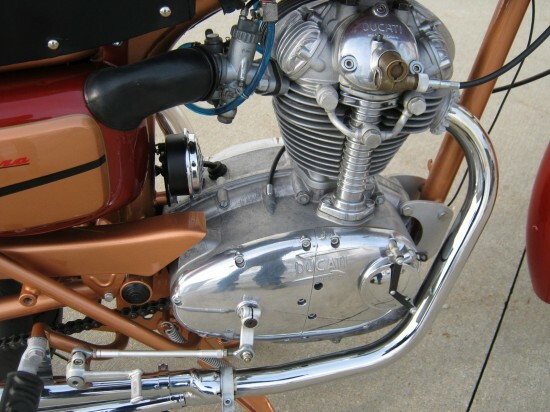 Just take a look at the towershafts and on this 1966 Ducati 250 Monza! 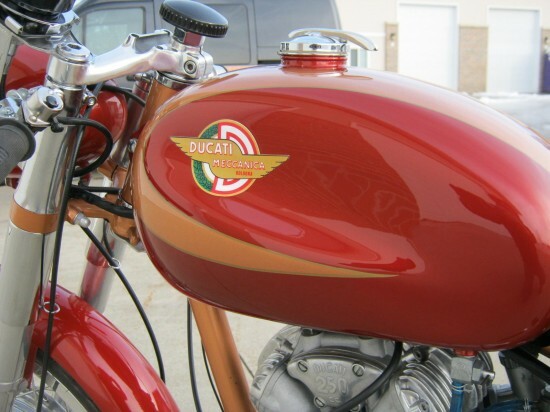 Ducati’s 250 single found its way into a variety of different bikes, including standard Dianas, the off-road Scrambler, and the sportier Monzas. 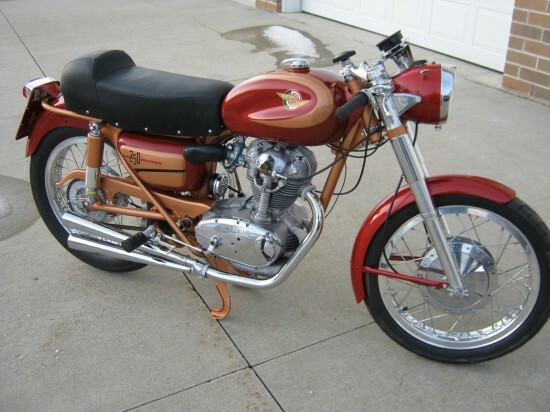 Producing 20hp and able to push the bike to a top speed north of 80mph, the bike was no performance slouch and the 250 was one of the fastest machines in its class at the time. I have restored this bike about 5 years ago. It was a low mileage bike with only 4,632 original miles as seen on the speedo. I did put aluminum ridge rims with new stainless spokes and tires. I had someone rebuild the motor and carb. All the cables are new. 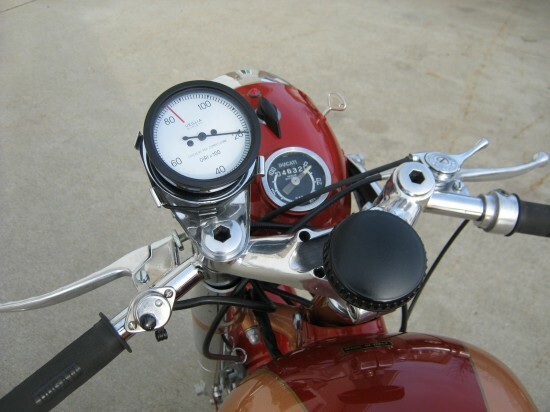 I put a new tachometer on it and recovered the seat. I replated all the chrome and all the cad hardware I polished all the aluminum and had a friend paint the bike. It looks beautiful in the sun. Everything works on this bike. The only thing I never got around to is getting a title so you need to get one. 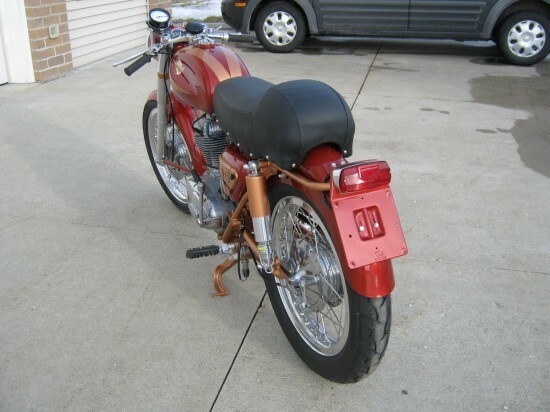 While the seller may not be great at describing his bike, it seems he knows what he’s about and this Ducati looks to be in very nice, although not completely original shape. Obviously, “restored” will never be as valuable as “original”, but when these get found as abandoned wrecks, there’s often little choice. I’m not sure how this one looked before he got started, but that period-correct paint scheme is gorgeous! The pipes don’t look stock and I’d be looking to replace them with something more original, or something simpler if I couldn’t find or afford the original, cigar-shaped items. But that gorgeous Veglia tach makes those pipes forgivable: I’d actually buy a classic Ducati, Laverda, Guzzi, or Benelli, just so I could have an excuse to fit one.